Cash is by definition the most liquid of the organization's current assets. Cash is ready to use immediately for any purpose. Management keeps close watch on liquid asset availability and performance. Liquid assets are either cash or other current assets that can (in principle) be turned into cash readily. The liquid or water metaphor appears often in finance and accounting, referring to the flow of funds. Funds that can flow quickly and easily are liquid. Assets that can trasnform into flowing cash in the near term reside on the Balance Sheet under the heading Current Assets. "Current" usually means cash flow is possible within a year or less. Accountants normally consider several asset categories (asset accounts) as having enough liquidity to qualify as Current assets. These include Cash assets, of course, but also Inventories, Accounts Receivable, other Short Term Receivables, and Short Term Investments. The Balance Sheet entries for these assets enter the calculations of liquidity metrics such as Working capital and the Current Ratio. Liquidity Metrics measure the firm's ability to meet near term spending obligations, by comparing the balances in various current assets categories to the firms Current Liabilities—payments the firm must make in the near term. The timing and management of cash flow is critical for meeting obligations and needs: Paying employees, paying interest on loans or bonds, or investing in new product development or an infrastructure upgrade, for instance. Management, therefore, takes a keen interest in monitoring Working Capital and the firm's Current Ratio. In the interest of operating efficiency, management also takes a keen interest in two inventory activity metrics: Inventory Turns and Days Sales in Inventory.The intent is to avoid excessive inventory carrying costs and maintain ability to meet customer product demands at all times. Management also watches closely two activity metrics that measure the firm's performance with accounts receivable: Accounts Receivable Turnover and Average Collection Period (or, equivalently, Days Inventory Outstanding DIO). The intent is to ensure that accounts receivable do not turn into doubtful accounts or bad debt expense. A liquid asset shortage (as indicated by low scores on liquidity metrics) is a signal that a company may not be able to pay short term creditor obligations on time or investing in activities necessary for survival and growth such as marketing or research and development. If the liquid asset shortage is severe, the firm may even have trouble meeting payroll. Where do current assets fit in overall asset structure? The firm's Current Assets Portfolio. Measuring Liquid Assets for the Neart Term. For more on measuring and using liquid assets, see the article Liquidity. For a complete introduction to cash flow metrics and financial statement metrics (business ratios) see the article Financial Metrics. The article Cash Flow provides an introduction to the principles of measuring and managing cash flow. For simple and detailed examples of cash flow reporting in financial statements, see Statement of Changes in Financial Position. The firm's liquid assets in various categories constitute a major component of the firm's overall asset structure, namely the firm's Current Assets Portfolio. Asset Structure, in turn is one of three different structures that firm's define from Balance Sheet items. Exhibit 1, below shows how (1) Asset Structure, (2) Financial Structure, and (3) Capital structure each build from Balance Sheet items. Exhibit 1. Current Assets are a major component of the firm's Asset Structure. The example shows how asset structure, financial structure, and capital structure all appear on the firm's Balance Sheet. These structures have meaning in terms of the relative magnitudes of structure components. Each Balance Sheet structure has meaning in terms of the relative magnitudes of items within one of the boundary lines in Exhibit 1. Exhibit 2 below shows how Grande Corporation's overall asset structure appears as a pie chart. Here, Grande Corporation has an asset base of $22,075,000 including Current Assets with book value of $9,609,000. Exhibit 2. Grande Corporation Asset Structure as a Pie Chart. Exhibit 1 above shows how components of the firm's overall asset base define the firm's asset structure. 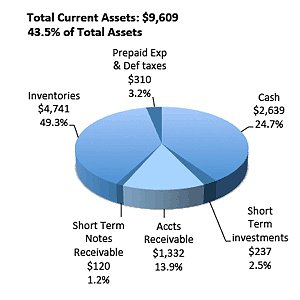 Current Assets (Liquid Assets) account for 43.5% of Grande Corporation's Asset base. However, each major component of the overall structure is itself a portfolio of different asset types, defining another structure in its own right. Exhibit 3, below, shows the structure of the firm's Current Assets portfolio. Exhibit 3. The structure of one company's Current Assets portfolio. Current assets are either cash itself, or assets that can quickly become cash, at least in principle. Exhibit 3 shows at a glance that the three Largest components of Grande's Current Assets Structure are (1) Cash, (2) Inventories, and (3) Accounts Receivable. Liquidity metrics such as working capital or the current ratio, in fact, all reflect the totals in these Current Assets categories. Having cash on handis necessary for meeting immediate spending needs. These may include, for instance, paying employee salaries, day-to-day operating expenses, or other short term obligations. Sufficient cash on hand also makes possible a quick response to changing market conditions or competitors actions. And, with sufficient cash, the firm can invest in product development and infrastructure upgrades. A cash shortage can prevent such investments. And, a severe cash shortage also puts the company at risk of defaulting on payments due to lenders, or even meeting payroll. Most firms, therefore, make it a priority to maintain sufficient cash for short term needs, but without building a large cash surplus. A large cash surplus is undesirable because cash sitting idle in an asset account is not earning interest or otherwise working productively. Inventories are obviously necessary for meeting production needs and customer needs. In manufacturing companies, inventory categories typically include Raw Materials, Work in Progress WIP, and Finished Goods inventories. A retail business, on the other hand, may have only merchandise inventories, waiting for sale to customers. In either case, acquiring, handling, and holding inventories can bring significant costs. Inventory management is the art of maintaining sufficient inventory to meet customer and production needs, while keeping inventory size and the time inventories are held to an absolute minimum. When firms achieve these objectives, scores on activity and efficiency metrics such as Inventory Turns and Days Sales in Inventory improve. And, when these metrics improve, the firm's Return on Assets ROA improves at the same time. Opposite results occur when excess inventory sits idle. Idle inventory is not working productively, causing efficiency metrics and ROA to suffer. Accounts Receivable are monies customers owe sellers for goods or services sold and delivered but not yet paid for by the customer. The only companies in business that do not have accounts receivable are the rare companies that always sell on a "cash only" basis.. Accounts Receivable legitimately belong to the Current Assets category because they should convert to cash in the near term, typically within 30 days or less. The challenge for management with Accounts Receivable is to prevent accounts due from slipping beyond the stated due period or, worse, having to be written off as bad debt. In fact most companies expect they will never collect a small percentage of their Accounts Receivable. In the interest of reporting accuracy, they recognize this reality by carrying an account Allowance for Doubtful Accounts." Firms measure their ability to manage Accounts Receivable effectively with activity and efficiency metrics. These metrics include Accounts Receivable turnover, and Days Sales Outstanding. Improvements in these metrics also improves overall company ROA. Do we have sufficient liquidity to meet short term spending needs? Are we currently building or losing liquidity? Do we have liquid assets enough to cover unforeseen emergencies this month? Current activity in the so-called Income Statement accounts—Revenue and Expense Accounts—do not always provide direct or helpful answers to such questions. This is because accrual accounting principles allow actual cash flow to occur at times different from the Revenue and Expense Transactions that ultimately cause the cash flow. When near term liquidity is a primary concern, however, Balance Sheet accounts for Current Assets and Current Liabilities provide better answers. Liquid assets, after all, reside on the Balance Sheet, not the Income Statement. Accountants and financial analysts measure current liquidity by defining near term as the same forward-looking time span that qualifies certain assets as Current Assets and certain liabilities as Current Liabilities. Thus, they usually define near term (or short term) as"within the next 12 months, or less." Sometimes, however, accountants interpret this definition to mean simply "the remainder of the current accounting period." Sections below present three popular liquidity metrics: Working Capital, Current Ratio, and Acid-Test Ratio. Each metric compares the likely funds available to the firm, in the near term, to the firm's likely near term spending needs. One reason that Working Capital metric is popular with businesspeople in all roles is that Working Capital is given in currency units such as dollars, pounds, or euro. Working capital, that is, signals directly the funds amount available for near term needs. When the CFO reports "We have $12,000,000 in working capital, or "Our working capital level has fallen to €50,000," everyone knows exactly what that means. Of the three liquidity metrics in this article, only Working Capital speaks in terms of currency units. The Working Capital formula above describes the calculation. This Example uses figures from the Grande Corporation Balance Sheet (Exhibit 4) below. How Do You Interpret Working Capital Results? How much working capital is enough? Companies address that question by projecting Current Liabilities and Cash inflows for the next year. Any Working Capital result greater than 0 signals minimally sufficient working capital. The company faces a serious liquidity crisis if its working capital will not cover such things as loan interest due, floor space leasing, or employee salaries and wages. Regarding unforeseen emergencies or contingencies, many firms establish so-called sinking funds, emergency funds,or reserve funds. For these funds, firms periodically pay into special purpose savings accounts set up specifically for those purposes. With these funds in place, the firm does not need to draw on working capital to cover these special needs. Where such funds are not in place, however, a current working capital balance of 0 may not be sufficient. Notice that the Current Ratio uses the same input data as Working Capital. Here, however, the metric results from dividing Current Assets by Current Liabilities. Because this metric is a ratio, it addresses a slightly different question: How do Current Assets compare to Current Liabilities? The result appears as a decimal fraction or percentage, not as an amount. How Do You Calculate the Current Ratio? How Do You Interpret Current Ratio Results? Note that a Current Ratio of 1.0 is equivalent to a Working Capital result of 0. Both metrics results signal that Current Assets equal Current Liabilities, exactly. Thus, a Current Ratio of 1.0 signals just barely sufficient liquidity to cover known short term spending needs. A Current Ratio substantially greater than 1.0 shows the firm also was funds available to cover unexpected spending needs, or to undertake new investment initiatives. Analysts consider a Current Ratio value of 2.0 or greater is a generally viewed as a rule of thumb standard for good liquidity. The result 2.7, therefore signals healthy liquidity for this firm. On the other hand, a Current Ratio under 1.0 is cause for alarm. If liquidity does not improve quickly, the firm faces defaulting on some of its outstanding liabilities, or reducing operations. When the liquidity problem is especially severe, employees can expect that the firm may soon miss "making payroll." The Quick Ratio (Acid-Test Ratio) metric is also defined as a ratio. Quick Ratio—like Current Ratio—compares Current Assets to Current Liabilities with a ratio. This ratio, however, carries the nickname Acid-Test Ratio because it is the most conservative of the liquidity metrics appearing here. The Quick Ratio is similar to the Current Ratio, except that the Inventories figure is subtracted from Current Assets in the ratio numerator. This reflects the common belief that inventories are the least liquid of Current Assets. The true liquidity of the firm's inventories assets depends somewhat on the firm's industry and the nature of it's business. With this knowledge, management can judge which is the more appropriate liquidity metric for this firm—Current Ratio or Quick Ratio. How Do You Calculate Quick Ratio? How Do You Interpret the Quick Ratio Message? While this company's Current Ratio (2.7) might seemed strong enough, the company's low Acid-Test Ratio might cause concern. Analysts generally consider an Acid-Test Ratio of about 1.1 as a minimum healthy level. Grande Coroporation's Quick Ratio is much lower than its Current Ratio because Inventories make up a relatively large component of Grande's Current Asset structure. Should Grande Corporation be complacent or should the firm be alarmed with these results? The answer has to do with the real liquidity of Grande's inventories. If inventory assets are relatively liquid (turnover at a high rate), then Grande management can rely on the Current Ratio result (2.7) as the better liquidity measure. However, if—given the nature of Grande's business and industry—these inventories are relatively illiquid, management should recognize the firm faces a liquidity crisis. Data for the Current Assets metrics calculations above come from the sample Balance sheet in Exhibit 4. Exhibit 4. Sample Balance sheet providing input data for Current Assets liquidity metrics.